Earlier today, Mehbooba Mufti said that she spoke with Defence Minister regarding the stranded passengers and was assured that arrangements would be made to airlift the people. Defence Minister Nirmala Sitharaman on Monday said the Army will airlift stranded students and others from Srinagar to Jammu and vice-versa as the national highway, the only surface link that connects the valley with rest of the country, is blocked due to heavy snowfall. She said she acknowledged the phone call of PDP supremo and former Chief Minister of Jammu and Kashmir Mehbooba Mufti on this matter and also spoke with Deputy Commissioner of Jammu. "Army to help air-lift stranded students & others from Jammu to Srinagar & vice versa. Inclement weather affected their movement. Acknowledge the phone call of @MehboobaMufti on this matter. Also just spoke with DC Jammu. @PIB_India @ANI @SpokespersonMoD @DefenceMinIndia," the Defence Minister tweeted. Spoke to @nsitharaman ji regarding passengers who have been stranded in Jammu for many days now. She has assured me that arrangements will be made to airlift them soon", Ms Mehbooba tweeted. 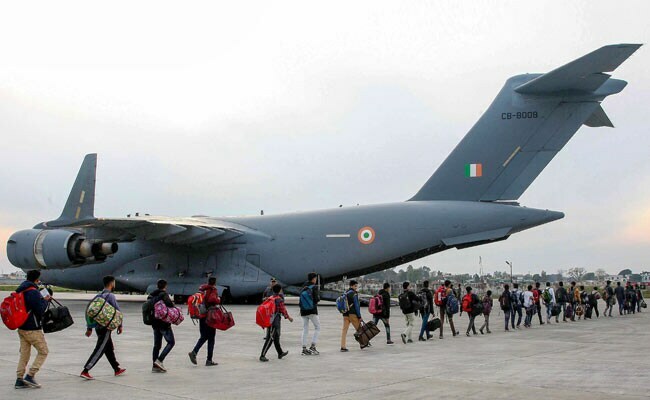 Indian Air Force on Saturday deployed C-17 Globemaster heavy-lift aircraft to transport 170 people stranded in Srinagar to Jammu. The Jammu-Srinagar National Highway has been closed due to heavy snowfall in the state. Evacuated people also included students who have to appear for their GATE exams. Multiple avalanches in the state of Jammu and Kashmir have left the Jammu-Srinagar National Highway closed. There has been complete disruption of transport services, leaving thousands of people stranded. Some people are reportedly trapped under snow at various locations across the region. As the 300-kilometre-long highway is closed, trucks carrying goods to the state are also stranded. Heavy snowfall has also led to depletion of fuel stocks following which administration directed fuel pumps on Thursday not to provide more than 3 litres petrol and 10 litres diesel per vehicle in a day.The heavy snowfall in the state has resulted in the loss of crops such as cabbage, apple, potatoes, etc.